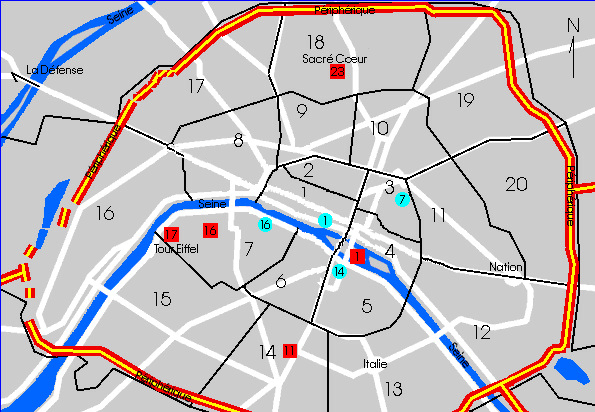 I am at map red-square-23, the Butte-Montmartre (Montmartre Hill) by Sacre Coeur basicila. 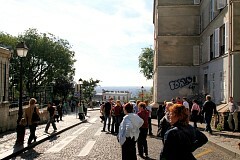 Montmartre is one of the main centers of crime and prostitution in Paris. On my way up the hill, I was greeted by sequential-rising-street intersections of men running a card variation of the Shell game - the infamous three-card Monty. The partially bald man just to the right in front of the boxes is one of the shills. The shill "won" 100 Euro, then the dealer asked me to play. "It's a scam" I told him, which really pissed him off. As I walked away, we traded insults. Then I thought, "Gee, he does have at least one buddy here, plus all the other guys on the other intersections ..." so I quickly lost myself in the crowd. Here is a peoplemover you can ride to the top of the hill. I used the stairs. 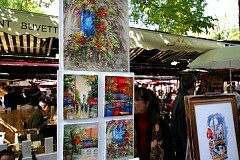 It's Sunday afternoon, the nicest afternoon of the time I am spending in Paris. 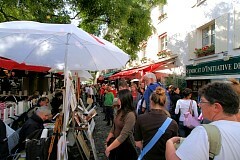 There is a central square located near the basicila where artists display their paintings for sale. The prices are way beyond what I could afford, but they are fun to look at. Vincent Van Gogh painted this picture, "Vegetable Gardens in Montmartre" in 1887 while living in Paris and hanging-out with fellow impressionist painters. 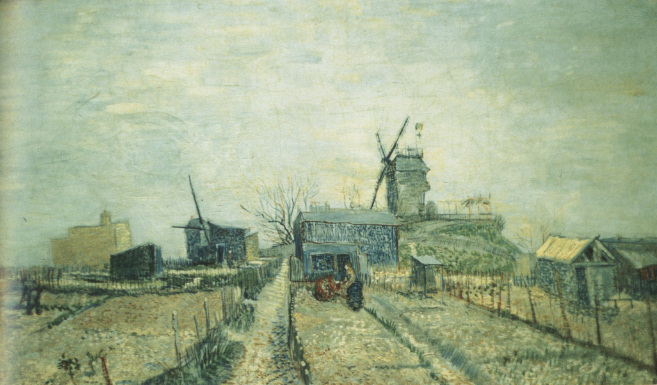 Windmills (moulins) have always been associated with Montmartre. The Moulin Blute-Fin is in the background - this area was considered outside of Paris proper and a slum. 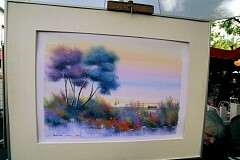 I liked the stylized trees and landscape on the left - and the unusual colors. 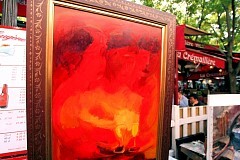 I am not sure of what to make of the brilliantly colored painting on the right, "Wine for the Glee Club in Hell"? 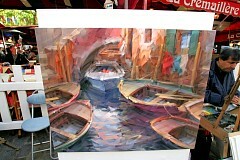 I really like the jangled boats in the painting on the left. It's hard to focus on them. It reminds me of Van Gogh's electric brush strokes. 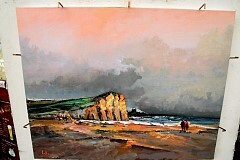 The picture on the right might be characterized as a impressionist seascape, which I also liked. 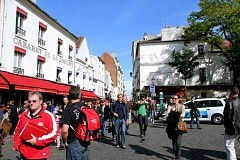 Leaving the art square, Sacre Coeur is on the left (left). 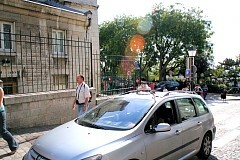 Last time I was here, I snapped a picture of a Paris cab. Here's another one. Back down from the hill. I didn't see my three-card Monty buddy on the way back down. I don't hang out here after dark. I think you would need lots of money to go to the caberets, and I don't feel it's particularly safe to wander around here at night. 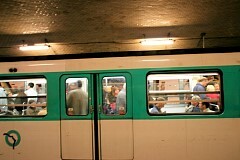 You have to be very careful in the Metro and train stations in Paris. Avoid standing on Metro trains - pickpockets are rife and it's harder for them to get you if you are seated. Keep passports, cash, credit cards and plane tickets in a money belt worn around your neck or around your waist. Don't wear jewelery - gold chains are bad. One of the English guys I was drinking with in Munich said he was wearing a gold chain in a Paris bar. He stood drinking and talking to some guy, then all of a sudden the guy ripped the chain off his neck and ran away. Be wary of any disturbance or nudging in a crowd. 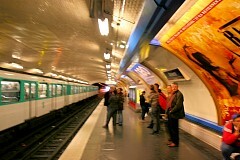 This is a pretty bad picture taken in the Metro - the Paris subway. 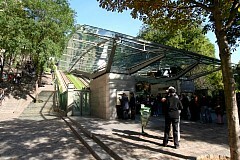 I was talking to a man and his wife waiting in line for the Picasso museum. He said that four of them were going single-file through the Metro turnstyle, when a pickpocket went for the 3rd person in their single-file group, not realizing he was the fourth. The man I was talking to said he just shoved the pickpocket to the ground - the pickpocket jumped up and ran off. It's best to sit on the Metro rather than stand - that makes it harder for someone to get into your pockets. 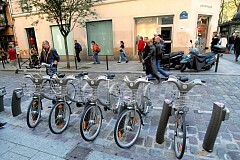 One encounters these rental bikes every so often. I wanted to remember to take a picture of them, so here they are.